The BBC British Film Festival is here. Beginning October 28 and running through November 18, get ready for 22 days awash with dry humour, costume dramas and wry romantic comedies. With all the fascinating new films from breakout film directors and a solid selection of classics, I had a hard time selecting only a few. Here are five to watch (with a cup of tea and a few scones) at this year’s British Film Festival. The Suffragettes were the trailblazing feminists of the early 20th century. They fought hard for women’s rights and made monumental leaps forward in the feminist movement. 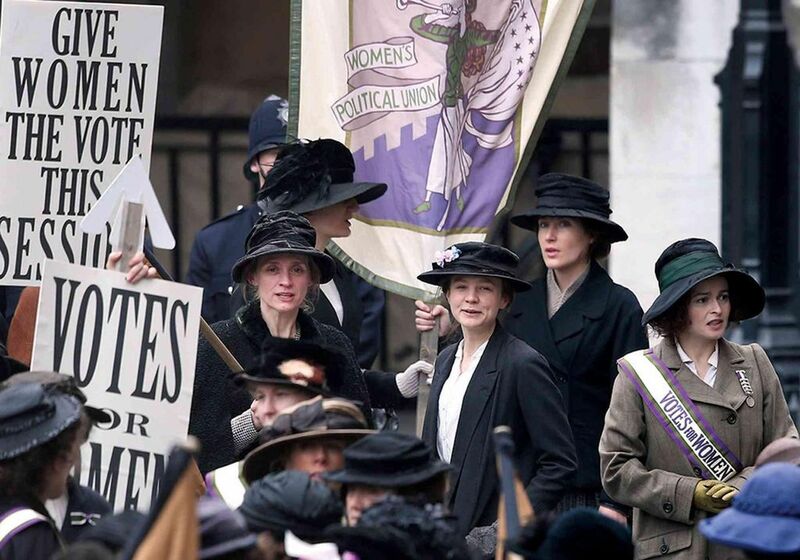 With a brilliant cast including Carrie Mulligan, Meryl Streep and Helena Bonham Carter, Suffragette follows Maud Watts (Mulligan), a working-class woman who finds herself drawn to the political tumult of the suffrage movement and its oppressors. The film gets the period right, from the bleak working-class factories down to the costumes and the handheld protest signs. Already garnering controversy in its early release, this looks to be an unapologetic and fierce historical drama—absolutely one to watch. More gritty realism from the nation that does it so well, The Program chronicles the rise and fall of cyclist Lance Armstrong, played by an intense Ben Foster (3:10 to Yuma, Kill Your Darlings). Doggedly following his every move, from surviving cancer to becoming a record-breaking cyclist, is the ever-sceptical journalist David Walsh, who seems determined to expose Armstrong’s lies. Walsh is played by Chris O’Dowd (The IT Crowd, Bridesmaids), convincing audiences he’s not just England’s funny man. Lance Armstrong’s story is an important one. It shows the mask being lifted from an adored celebrity, revealing an insecure cheater and a fraud. I don’t doubt The Program will be talked about for years to come. Ever have yourself a really bad day? One where a simple mistake irrevocably changes your life forever, making it far, far worse? Barney Thomson has. After accidentally stabbing his boss with a pair of barber’s shears, meek and unassuming Barney (Robert Carlisle) is trying to dispose of a body, dodging police officers dealing with his erratic mum, played by the impeccable (as far as I’m concerned) Emma Thompson. The Telegraph called it ‘deliciously macabre’ and by the looks of things, they’re right on the money. Carlisle’s directorial debut is about as inky-black as a black comedy gets, and it looks like an absolute riot. Certainly not for the faint of heart. Director Jon Spira (Anyone Can Play Guitar) received funding from Kickstarter for this documentary, yet its subject matter has legions of followers all over the world. Elstree in Northern London was where George Lucas first started filming the Star Wars. The film is a selection of intimate portrayals of the unsung heroes of these legendary films. The actors donning the costumes, makeup and storm trooper outfits tell their stories as small parts of some of the biggest movies ever made. This is the perfect flick to build anticipation with the seventh Star Wars instalment just around the corner, but it’s also a documentary about humble beginnings, fandom and the people who stand outside of the spotlight, on the same stage as the main players. In addition to new films, the British Film Festival is also showing 10 classic romance films covering decades from 1900 to 1990. A great opportunity for anyone who wants to educate themselves on a bit of British cinema, or anyone who wants to revisit some of their favourites. The Prime of Miss Jean Brodie (1969), set in the 1930s, came during the political and social upheaval of the 1960s, its subject matter drenched in the feminist movement and the decline of the hippie era. Maggie Smith (the Harry Potter films) plays Jean Brodie, a high school teacher who doesn’t conform to the conservative methods of her contemporaries. She wants to inspire her students to follow their passions, create art and be involved in politics. It’s a classic with an inspired performance by Maggie Smith, and certainly worth a revisit (or a first visit) at this year’s festival. Some of the most distinguished actors and accomplished filmmakers have come out of the UK. But so has some of the most off-the-wall humour and twisted comedies. These picks will hopefully help with your putting together a schedule, but they’re only a fraction of what’s on offer. Be sure to check out opening night for cake, wine, appetizers and Michael Caine’s latest film, too. Head over to the website and check out the guide for more. See ya there, mate! The BBC British Film Festival runs from October 28th to November 18th at Palace Cinemas Como, Balwyn and Brighton Bay. All of the venues are wheelchair acceptable. [text-blocks id=”351943″] of Asha Holmes Publicity.